The Sacred Made Real is a result of Xavier Bray’s enthusiasm and perseverance. Curator of Spanish Paintings at the National Gallery in London, he is naturally the curator of this exhibition, immediately described as “mystic” by the public, and which can be approached from several angles. First of all, it works as a touchstone, offering a major contribution to the history of Spanish religious painting after the Council of Trent, in an attempt to do away with certain clichés too often bandied about, by bringing together thirty-five 17th century masterpieces. This impressive demonstration is achieved thanks to a juxtaposition with the sculptures of Martínez Montañés, Gregorio Fernández, Juan de Mesa, Pedro de Mena and Alonso Cano. Thus, the other major point of interest of this exhibition is to have assembled about twenty large polychromatic sculptures, barely known except inside the Iberian peninsula, for the first time outside of Spain. Most of them, in fact, had to leave the places of worship where they are still venerated today by the faithful in order to attend this event. The most fascinating loan is the Saint Francis in Ecstasy by Pedro de Mena (ill. 2), one of the jewels of the Toledo cathedral, which was consequently restored and x-rayed. 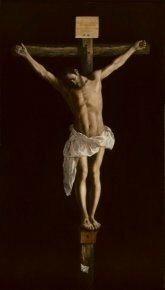 Due to the comparison with canvases by Velázquez, Ribera, Zurbarán and the same Cano, Xavier Bray proves that the austere realism which dominated painting in the first half of the 17th century does not stem so much from the supposed influence by Caravaggio and his followers as it does from the familiarity that these young painters had with polychromatic wooden sculpture. Choosing to avoid a retrospective, the curator has concentrated on the 17th century alone, essentially even on the first half, the period during which this “paragone” is strongest. 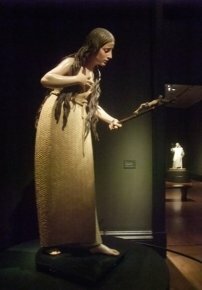 However, the 16th century played a major role in enabling the survival and the development of this sculpture technique, thanks to outstanding artists, and which imparted, in the case of Greco or Morales, both reality and feeling to devotional images while marble had invaded many parts of Europe. Photo : Fototeca de Obras Restauradas. 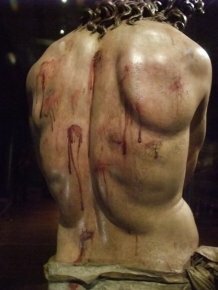 The starting point of the show is therefore a specific element in the training and activity of the painters, heretofore overlooked : they were entrusted with painting the clothing and flesh of these wooden statues, both those used in the processional pasos as well as the devotional images placed in the chapels. The statutes of the carpentry guild to which sculptors belonged were clear : the sculptor cannot carry out this task, he must hand his work over to the “pintor de ymagineria”, painter of images who, through colour, brings it to life. To one side of the exhibition, room 1 of the National Gallery welcomes The Making of a Spanish Polychrome Sculpture : the analysis and restoration of Saint John of the Cross by the Andalucian sculptor Francisco Antonio Gijón, held at the National Gallery of Art in Washington (ill. 3 ; see news item, in French, of 21/2/04), exhibition partner, offers a detailed presentation – retraced in the article by the restorers Daphné Barbour and Judith Ozone included in the catalogue – of the methods used in sculpting, assembling and painting these effigies. What might appear to be a menial task was in fact one of the main activities for young painters such as Velázquez or Cano during their training period in a master’s workshop, in this case that of Francisco Pacheco, before taking their exam for “pintor de ymagineria”. The aspiring painter then tackled three-dimensional work, the reality of the body and the specific requirements of working with light. Although possessing only modest talent, Francisco Pacheco was a remarkable master (1564-1644) and analyzed all of these aspects in his Tratado de la pintura. He knew what he was talking about as he was practically official painter of Martínez Montanés whose talent he serves in a remarkable manner, suggesting the reality of a complexion, a shadow or a fabric. This exhibition represents at last his moment of glory, revealing his true savoir-faire. The opening work to the show is the portrait of Martínez Montañés by Velázquez (ill. 4) symbolizing the constant eye which painters of his generation kept on sculpture. 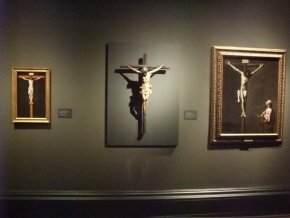 The relatively small number of works exhibited allows for a visit within spacious rooms, mixing formal searches and iconographic themes enhanced by the dark backgrounds, thus creating a solemn and austere atmosphere. The great theme of Christ on the Cross is used to demonstrate this quest for reality dictated by Post-Trent spirituality. 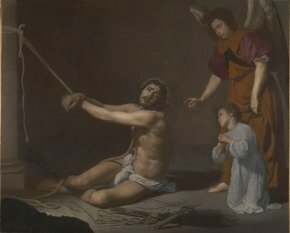 Next to the undeniable Classicism of Martínez Montañés, the Cordoban painter Juan de Mesa (1583-1627) opened the way for a more expressive treatment of the body which he carried to an exceptional degree of realism in his Head of Saint John the Baptist (Cathedral of Seville) while Saint Luke Contemplating Christ on the Cross (ill. 1) by Zurbarán finds us in the midst of these two opposing visions. The juxtaposition, favored by a skillful hang, of the two paintings of the Immaculate Conception, by Martínez Montañés (1606/08, El Pedroso and about 1628, Church of the Annunciation, Seville) and the other Immaculate Conception by Velázquez (about 1618, National Gallery, London) show the enormous influence wielded by the sculptor on the very young painter in its volume, the contraposto as well as in the staging, with the sharp contrast of dark and luminous colours. 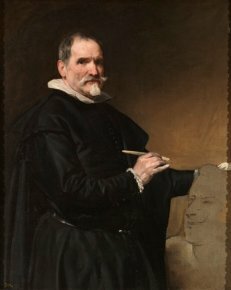 A bit further along in the exhibition, Xavier Bray offers another source of influence for Velázquez after he settled in Madrid : the great sculptor from Valladolid, Gregorio Fernández, highly appreciated by Philip IV, who worked frequently for the court and whose works could be found in Madrid. Bray placed an Ecce Homo (ill. 5 and 6), clearly influenced by Italian models but óf a gripping expressionism, underscored by the polychromatic finish, next to the Christ after the Flagellation by Velázquez (ill. 7) : the demonstration seems convincing and should help establish this canvas which is still of a characteristic Sevillian theme as produced before the painter’s first trip to Italy (1630/31). Christ Dead (1625, Museo Nacional San Gregorio, Valladolid), isolated in another room with a Lamentation by Ribera (about 1620, National Gallery London) shows that the artist abandoned classical sources when treating the anatomy in favor of a pathos filled hyper-realism. 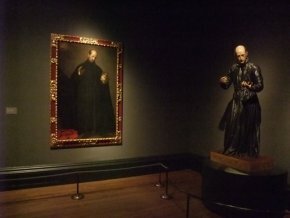 The next section is devoted to portraits, religious obviously, and represented here with three masterpieces by Martínez Montañés, life-size portraits of Saints Bruno (Seville, Museo de Bellas Artes), Francis Borgia and Ignatius Loyola (church of the Annunciation, Seville) in contemplation before a crucifix. Across from these, the painters directly influenced by him : the young Alonso Cano (1601-1667), obviously indebted in his monumental Saint Francis Borgia (1624, Seville, Museo de Bellas Artes). A sculptor himself, his works had to be painted by another artist but at the end of his life he did one of his own sculptures with superb refinement, a head of Saint John of God (Granada, Museo de Bellas Artes) in which he had inserted glass eyes. 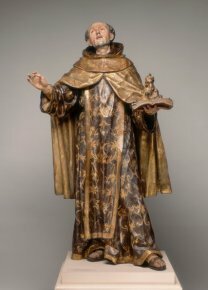 The fact that Zurbarán painted sculptures is documented. 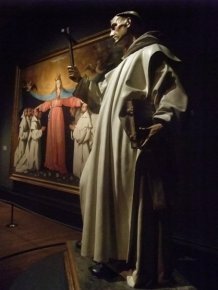 His unique manner of painting the white habits of the Carthusian monks probably owes much to the Saint Bruno by Martínez Montañés (ill. 9), meant for the Carthusian monastery in Cuevas just like the painting The Virgin of Clemency (ill. 9 ; Seville, Museo de Bellas Artes). 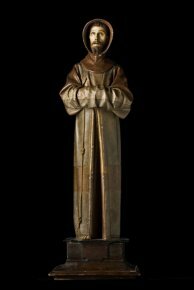 The folds of the fabric are identical, one of the painted monks reveals the same face as the sculpture. This comparison might provide some light on the problems encountered in dating the canvas. Then there is Saint Francis of Assissi, or rather the mummified saint in ecstasy represented just as he was found when his tomb was opened in 1449. In this case, it was quite likely the painter who influenced the sculptor : the prototype created by Zurbarán (Musée des Beaux-Arts, Lyon), alas, missing in the exhibition, but represented by the Boston version, reveals many similarities with the famous effigy created by Pedro de Mena in 1663 for the cathedral in Toledo (ill. 2). A close observation of the work after restoration here reveals the surefooted progress of Spanish polychromatic sculpture towards an even more pronounced realism, achieved not only through the systematic use of glass eyes, human hair for the eyelashes, glass teeth, real rope to tie the habit but also due to precise polychromatic details. Starting in mid-century, the sculptors got around the prohibition of doing their own painting, increasingly harder to accept, by obtaining their certificate of “pintor de ymagineria”. This opened the way to a continuously more intense pathos in the realism employed, which Mena was the first to interpret (Ecce Homo, 1673, Descalzas reales, Madrid). The presence of the large representation of Mary Magdalene in Penance (ill. 10), probably located originally in a cave, underscores Mena’s decisive role in developing a more emphatic expressivity. From then on, the association between painting and sculpture grew further apart, thus bringing the subject of the exhibition to a close. One of the most powerful moments in the show is the hang of Christ on the Cross (ill. 11) painted by Zurbarán in 1627 for the sacristy of convent of San Pablo in Seville. The canvas appears here as it originally hung, with the upper part arched, thus considerably reinforcing the impact of the crucified body. This tour de force of painted illusion, which he was to use a year later in his San Serapion (Wadsworth Atheneum Museum), presented in the same way as in the mortuary chapel of the Convent of the Mercy Brothers in Seville, could only have been produced by a painter acutely aware of the power sculpture exerts on space. This exhibition, accompanied by a remarkable catalogue in both the clarity and erudition of the texts as well as the quality of the reproductions, offers a new field of thought to art historians of the Spanish Golden Age. 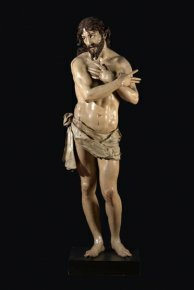 It allows the general public to discover the magnificent art of Spanish polychromatic sculpture, too long considered simply a picturesque and marginal manifestation of the Spanish mentality, linked more to the world of religious devotion than to artistic creation. Under the supervision of Xavier Bray, The Sacred Made Real, Spanish Painting and Sculpture 1600-1700, National Gallery of London, Yale University Press, 2009, 208 p., 19.99 pounds (paper binding), 35 pounds (hard binding). This catalogue can be acquired on the National Gallery of London’s website. Visitor information : The National Gallery, Trafalgar Square, London WC2N 5DN. Phone : +44 (0) 20 7747 2885. Open every day from 10h00 to 18h00, Wednesdays until 21h00. There is an entrance fee to the exhibition (the rest of the museum is free).